MELODY'S ......: Would u eat here? 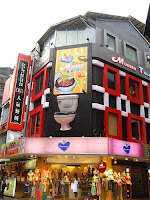 Modern Toilet is a Taipei restaurant. It accommodates 100 seats with each made from toilet bowls. The specialties at the restaurant accompany sink faucets and gender-coded 'WC' signs that appear on the three-story structure. The food is served in mini plastic toilet bowls. The toilet rolls that serve for wiping hand and mouth are hung above the tables, which may resemble glass-topped jumbo bathtubs. I got these from forwarding mail and pleased to share it with u.